March 1, 2018 (Jackson, Miss.) 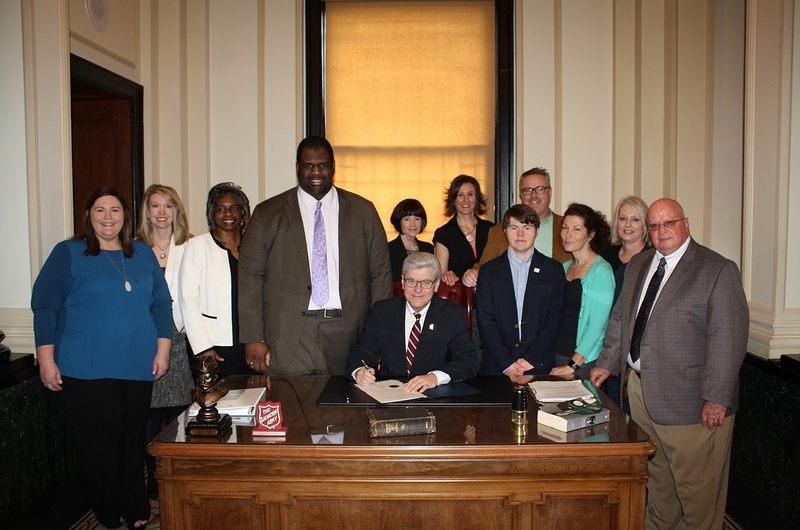 The Mississippi Department of Mental Health (DMH) is joining thousands of people and organizations all across the country in celebrating the month of March as Intellectual and Developmental Disabilities Awareness Month. In recognition of this event, representatives of DMH, the Bureau of Intellectual and Developmental Disabilities (BIDD) Advisory Council and persons with intellectual or developmental disabilities joined with Governor Phil Bryant on Wednesday, Feb. 28 as he signed a proclamation declaring March as Intellectual and Developmental Disabilities Awareness Month in the State of Mississippi. DMH has also joined with the BIDD Advisory Council to launch a campaign highlighting the connection between people with intellectual and developmental disabilities (IDD) and their communities. The campaign, titled “Celebrating Mississippians with Intellectual and Developmental Disabilities,” will feature videos, stories, posters, and graphics about people with intellectual or developmental disabilities that are embracing choices and enriching their lives through employment, home ownership, social relationships, and a variety of community activities. The BIDD Advisory Council includes REM Mississippi, The Arc of Mississippi, the Institute for Disability Studies at the University of Southern Mississippi, the Department of Education, Brandi’s Hope, the Coalition for Citizens with Disabilities, the Department of Rehabilitation Services, the Council on Developmental Disabilities, the Division of Medicaid, Communicare, Disability Rights Mississippi, MIDD-West Industries, Warren-Yazoo Mental Health, consumers of disability services and their family members. Celebrating Mississippians with Intellectual and Developmental Disabilities will be promoting awareness about IDD and illustrating that people with disabilities have the ability to contribute significantly to their schools, families, relationships, neighborhoods, faith communities, and the workforce, and they have the right to work, worship, learn, and enjoy life wherever they choose. The personal stories, videos, and other information will be shared digitally on social media and through grassroots outreach throughout the state. To view this information, visit the DMH web site at www.dmh.ms.gov. Photo Included: Pictured are representatives of DMH and the Bureau of Intellectual and Developmental Disabilities Advisory Council with Governor Phil Bryant as he signs a proclamation declaring March as Intellectual and Developmental Disabilities Awareness Month. They are (L to R) Molly Portera with DMH, of Madison County; Wendy Bailey, with DMH of Rankin County; Shirley Miller and Micah Miller, of Hinds County; Renee Brett, Director of the Bureau of IDD in DMH, of Madison County; Jessica Mathews with REM Mississippi and BIDD Advisory Council Chair, of Rankin County; Matt Nalker with The Arc of Mississippi and BIDD Advisory Council Vice Chair, of Hinds County; Noah Duffy and Kim Duffy of Jackson County; DMH Executive Director Diana Mikula, of Rankin County; and Robert Landrum of Jones County, Chair of the Board of Mental Health. DMH is supporting a better tomorrow by making a difference in the lives of Mississippians with mental illness, substance use disorders and intellectual or developmental disabilities one person at a time.